This entry was posted in Academia, PhD Life and tagged acting, cartoon, cats, comic, directing, theatre, thesis, writing by binarythis. Bookmark the permalink. OK I can hear people saying what has this to do with Feminatronic but it does put the whole process of creativity ( and how I work here at Feminatronic) into a great comic strip. ❤ That was the best. I still have it xxxx I hope to create with you again! Amazing. 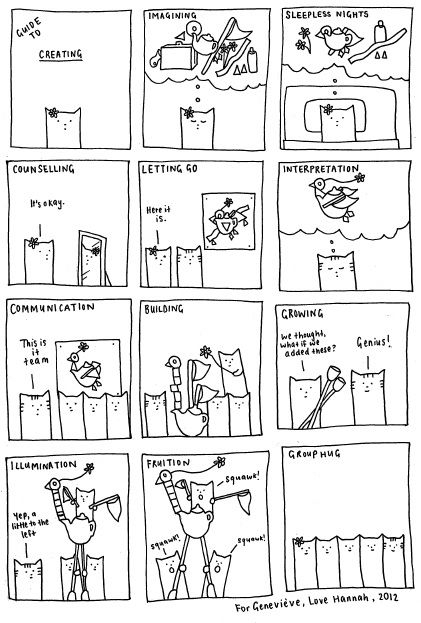 The ‘letting go’ phase reminded me how I worked as part of a creative team and my colleague, during a particulary stressful and tough month, printed out 5 stages of grief in large bold letters and glued those pieces of paper all over our room. And I mean large A3 sheets. It didn’t help us directly, but other people started avoiding us on corridors. Great blog, I will follow. Wonderful. I suspect there’s a whole row missing in between “sleepless nights” and “counselling”. That would be self-doubt, panic, bewilderment… or some such. Keep up the wonderful work, and the originality.